In Tip #25 we discussed "protecting your blog" in regards to using a Copyright. This tip is about "protecting your images" by applying a watermark to them. This makes it hard for someone to "steal" your artwork and use it as their own. Unfortunately, it does happen. TypePad has a great new built-in image editor! You can quicky and easily apply a watermark (text) to the images in your posts without having to use another program. You can do it right then and there in creating your blog post! Click here to read my tutorial on how to add a watermark and use TypePad's image editor. Additionally, you may use free programs like GIMP or Paint.Net, which are free programs, and use them to create a watermark. Amy Celona has a Paint.Net tutorial, click here. You can have a watermark cover your image diagonally or horizontally, but here are two examples I have used. Here is an example I use for my artwork created for Stamping and Blogging. It has a solid watermark and in color. Click here to get recipe for this card. Here is another example I have used for my personal paper crafting site, Hand Stamped By Heather, and the watermark is faded/transparent text. Click here to get details on this holiday project. At Stamping and Blogging we have image editing videos, such as how to create a watermark using GIMP, applying it to your artwork, and then saving the image. 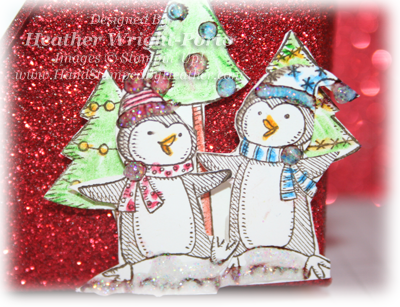 Come join us at Stamping and Blogging!